Trying to pack on some mass? Do you want to be a total beefcake? Well, toss on this Adult Fat Suit Costume and you’ll be the biggest stud walking around any costume parties this Halloween! Why waste time on binge eating, like it’s your job when it’s ten times easier to slip into this flesh-colored padded jumpsuit? With this costume, you’ll instantly look as if you’ve devoured every single crumb from every last buffet in town. If you want, this jumpsuit can be your entire costume. You can just run around as everyone’s favorite overweight nudist. However, you can get tons of laughs when you add this as an accessory to a variety of other costumes! Be a fat version of any celebrity you wish, like a chunky Chuck Norris. Bless your friends with the presence of a bigger-than-life character like Uncle Buck or Tommy Boy. 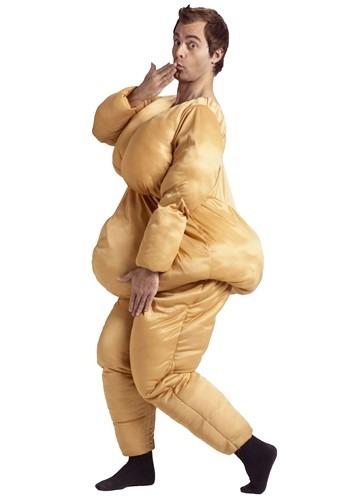 Use this fat suit as a start to an awesome sumo-wrestler costume. Be a walking and talking contradiction when you enter the party scene as a chubby aerobics instructor. These are just a few ideas that come to mind and there are plenty more options with this hilarious fat suit!